Good Morning! I’m back from my holiday!! I just had the most amazing trip and wanted to share with you all a potentially great idea for an itinerary for Sri Lanka. My main part of my holiday was Sri Lanka but I added a wee 1 night in Doha and 4 nights in Singapore and what a combination. I should highlight we do connect perfectly on the EDI – CMB return, I added in Doha for my family to see and see friends in Singapore, o.k and to sadly fly on our new A350 from DOH – SIN…it was fantastic! I hope my destination information is useful. Everyone tends to speak English but your tour guide/driver will translate if ever needed. This is where I need to highlight, you definitely do not drive anywhere yourself! So please do warn customers if they consider. The local currency is Sri Lankan Rupees. I highly recommend to exchange money from British Pounds (English notes) when arriving at CMB airport for the best exchange rate, otherwise you need to pre-order at most exchanges in the UK and you do not gain the best rate. I highly recommend not using the cash machines on arrival, there are exchange booths at the airport. All major credit cards are fine to use but only use in major hotels/establishments. Weather – they do not really have seasons. Wet and Dry but this can also change depending what part of the Country you are in. Average temperature 28C high humidity. It is cooler in the hills of the tea plantations. Religion – the two main religions are Buddhism and Hinduism, although there are a number of Muslim temples, mainly in Colombo. I recommend keeping shoulders and knees covered when out and about, especially when visiting temples (arms and legs covered). Visa – A visa is required, it is around £30 for UK Citizen, this can be applied for online. Day 1: Arrival, meet greet and proceed to Colombo. Day to relax, evening city tour of Colombo, like many capital cities in developing countries is fast changing its face. Including 100-year-old clock tower, Pettah bazaar – where one can shop for bargain, a Hindu and a Buddhist temple, residential areas where you find the stately homes of the affluent, the Colombo museum, the Bandaranaike Memorial International Conference Hall (BMICH)-, and the Dutch Museum. 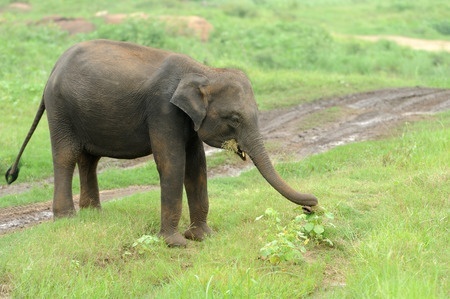 Jenna’s personal note – Elephant orphanage is a must see. This hotel is hands down one of my most favourite hotels in the world, I would recommend more than 2 nights if possible. I almost don’t want to tell anyone about it to be honest; I want it to be my secret. Day 3: Excursion to Sigiriya. Climb the 5th century Sigiriya rock fortress which is a world heritage site, built by King Kashyapa (477-495 AD). The ‘Lion Rock’ is a citadel of unusual beauty rising 200 metres from the scrub jungle. Jenna’s personal note – As my parent’s physical fitness is not excellent in their older age this was not suitable for them to climb, so please take this into consideration. You can still get some great photos though! Instead we went for a safari, which was fantastic! Saw elephants, buffalo, jackals, snakes and monkeys (for leopard’s best to go on safari in the South). Day 4: Proceed to Kandy en-route visiting Dambulla Temple, also a spice garden in Matale to see different spices which Sri Lanka is famous for. Here, clients could see different spices and how some of these spices are grown and processed. Jenna’s personal note – Hotel is beautiful with gorgeous views of Kandy, although, you cannot easily go for a walk as this hotel is situated in the old part of Kandy on a hill. The hotel is very accommodating and great food but not for the free spirited. Rooms are fit for royalty. Day 5: Visit to the Peradeniya Botanical Gardens. Jenna’s personal note – sounds a bit boring but I loved seeing the giant fruit bats in the trees. Quite a walk so golf carts are available for not so mobile. On completion do a city tour of Kandy. Kandy was the last capital of the Sri Lankan kings which is a World Heritage Site. The name “Kandy” conjures visions of splendour and magnificence. Many of the legends, traditions and folklore are still lovingly kept alive. Visit the Kandy town and Bazaar, the arts and crafts centre, a gem museum and a lapidary. Also visit the Temple of the Tooth Relic in Kandy. Thereafter witness a Cultural show.